Cross river gorilla is the largest one among primates like humans. It can weigh up to 600 pounds. 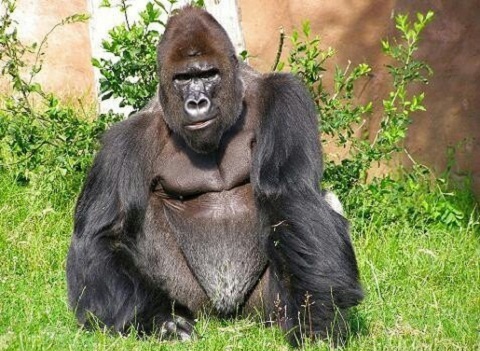 Gorillas are classified into two types of lowland gorillas. It is also called Grauer’s gorilla. Mountain gorillas fall under this category. It is the largest of all the gorillas living now. Cross river gorillas belongs to the western lowland gorilla. They have reddish hair on its head and greyer coat. Also, they have smallest head of the gorilla group. Cross river gorilla live in groups of about 5-9 gorillas depending on species known as “troop”. The adult male, Silver back is the head of this group. Gorillas live in Africa in countries like: the Central African Republic, Gabon, Cameroon and the Republic of Congo. They also live in upper slopes of mountain called mountane, swampland and forests. Cross river gorilla would like to have bark and liana throughout the year and less fruits during scarcity. They generally eat terrestrial herbs, tree bark, pith, leaves and fruits. Fruits are its favorite food source but during dry season, they depend on other food sources. They use weapons in defeating humans. They also use to throw tree branches and clumps of earth at humans. But gorillas never attack humans unless provoked. The arms of cross river gorilla are larger than its legs which help them for knuckle walk, a walk on knuckles of their hands. Gorillas are smart and use tools and sign language in captivity. They communicate using sounds, body posture, gestures and by slapping on chest. Gorillas are non-aggressive and shy animals. Cross river gorillas are endangered species and humans are the only predators.